Success beyond imagination. 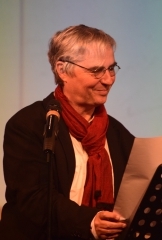 Over 100 people responded to the call of Dominique Sorrente, seconded by Richard Martin, in support of the palestinian poet Ashraf Fayad, condemned to death for apostasy in Saoudi Arabia, in November 2015. 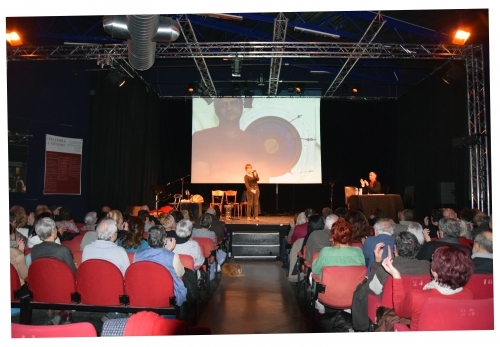 An attentive & solidaire public met in the lounge Léo Ferré of the Toursky theatre to share this encounter organised by the Sciptorium, and co-organised with the Toursky theatre, the Union of Poets & co and the review of the Archers. Rather than formal speeches, a moment in three time : sign posts, traces, evocations. Dominique Sorrente set the tone in his opening remarks, pleading for poetic liberty against the golden calves of our age, and more specifically, religious derailment and rhetorical propaganda. « We cannot remain arms folded, in face of this unjust decision, this act profoundly directed against poetic liberty. Beyond petitions, we have searched the proper way to react with our meagre means, a time of poetic fervour….. » declared the organiser of the evening. There followed brief but intense interventions by Richard Martin of the Toursky, Brigitte Gyr of the Union of Poets & co, Henri-Frédéric Blanc for the review of the Archers, and Isabelle Pellegrini of the Scriptorium. As the evening was to be foremost a moment of sharing and of action in poetry, one could hear the poems incriminated by the Saudi judges, drawn from the « Internal Instructions » of Ashraf Fayad, followed by the reading at multivoices of a beautiful text of the syrian poet Abou Afach, with some fragments in arabic. 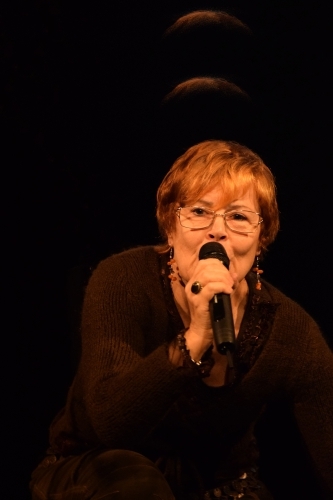 The italian poetess Viviane Ciampi, who especially for this occasion came from Genoa, shared a text of Erri di Luca with a captivating personal performance. There remained the challenge of combining the vibrations of the moment with the desire for tangible practical action. This was executed in simple words by a young exiled palestinian representing Amnesty International. The evening stretched over two hours, out of the ordinary world. It was a distinct life moment, well expressed by one of the participants over the friendly drinks following the presentations : It really warms the heart for him, the condemned poet, and for all of us who wish to continue to hope ». A moment of hope against an exceptional violence. At the start of the evening, Dominique Sorrente gave encouraging news ; he heard that the saudi judges of Abha had just delayed, two days before this reunion, their decision on the recourse requested by the lawyer of Ashraf Fayad. A fragile indication but in the right direction, showing a possible hesitation of the judges, and likely of the Saudi government, in face of the international protests on this cause. 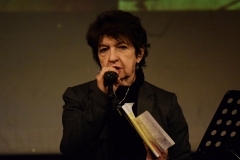 The gathering of support held in Marseille, at the initiative of the poetry association The Scriptorium, is only the third such meeting in France to-date, following those organised by official institutions, the Maison de la Poétrie of Paris and the University of Strasbourg. An example for other cities and regions, a proof that civil actions can have non-negligable impact in this domain. Marseille, by this gesture of a few, has shown that far from trivial quarrels, ever more insignificant, the spirit of solidarity in poetry exists. The objective of the evening was to sensibilise as wide a public as possible to lead to annulment of the sanction, and pay tribute to the poetic voice in all its forms in this human dynamics. And also, to send a message of solidarity via poetry from Marseille to Ashraf Fayad. 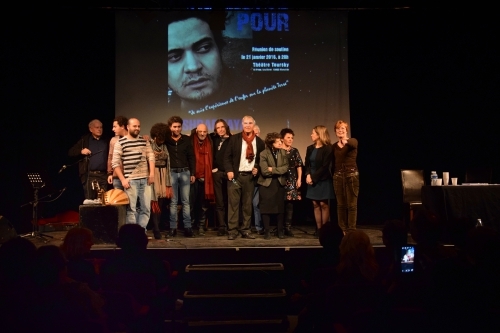 A lovely and unforgetable evening of solidarity in Marseille for the poet Ashraf Fayad condemned to death for apostasy. It was only the third in France of a long series that will unfold world-wide. For are not poets also « sentinels » charged with the defence of liberty, draped in modest dress which is their voice, brought together by the spirit of anxiety ? How well the poetic voice can still burn in this world. It is our duty to keep its flame alive. 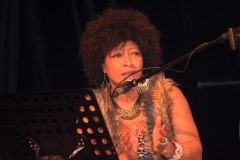 Ces deux poèmes nous ont été confiés par la poète italienne Viviane Ciampi lors de la rencontre de solidarité avec A.Fayad, le 21 janvier 2016, à Marseille, rencontre pour laquelle elle avait fait tout spécialement le déplacement de Gênes avec le photographe Lino Cannizzaro. ce qui demeure enfoui sous la muraille du monde. 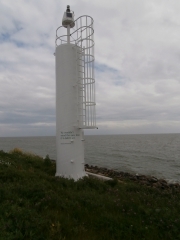 Une clef gisait au fond mais qui aurait pu la prendre, qui. Le sais-tu j’ai failli me quitter – non non – disais-tu. que toutes les vaches se sont retournées avec leurs bons yeux de vaches. de toute leur force debout. Écoute. Le temps éclate dans les veines. C’est à eux désormais que je m’adresse. ciò che rimane sepolto sotto le mura del mondo. Una chiave giaceva sul fondo ma chi avrebbe potuto prenderla, chi. Tu lo sai quasi mi stavo lasciando – no no – dicevi. che tutte le vacche si sono voltate coi loro begli occhi di vacche. coloro che impiccati – corda ancora rovente – ci interpellano con tutta la loro forza in piedi. Ascolta. Il tempo scoppia nelle vene. È a loro che mi rivolgo d’ora in poi. J’attache de la valeur à toute forme de vie, à la neige, la fraise, la mouche. J’attache de la valeur au règne animal et à la république des étoiles. J’attache de la valeur au vin tant que dure le repas, au sourire involontaire, à la fatigue de celui qui ne s’est pas épargné, à deux vieux qui s’aiment. J’attache de la valeur à ce qui demain ne vaudra plus rien et à ce qui aujourd’hui vaut encore peu de chose. J’attache de la valeur à toutes les blessures. à se taire à temps, à accourir à un cri, à demander la permission avant de s’asseoir, à éprouver de la gratitude sans se souvenir de quoi. J’attache de la valeur à savoir où se trouve le nord dans une pièce, quel est le nom du vent en train de sécher la lessive. J’attache de la valeur à l’usage du verbe aimer et à l’hypothèse qu’il existe un créateur. Bien de ces valeurs, je ne les ai pas connues. Erri de Luca, poème extrait de Œuvre sur l’eau. Traduit de l’italien par Danièle Valin, éditions Seghers, 2002. Cité dans Tout doit disparaître (chapitre 8), Mikaël Ollivier. Ed. Thierry Magnier, 2007. 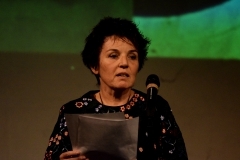 Pour prolonger la (re)découverte, voir la note sur la lecture donnée par Joëlle Vinciarelli et Alain Freixe, « Emilie Dickinson, une âme en incandescence (1830-1886) » donné au Non-Lieu à Marseille, le 28 mai à 20h30.